They hide a glass and leaf block's texture side. See photos attached. In contrast, placing other partial block layers (rplatham tested a slab, some stairs, carpet or snow) does not cause the glass block's side texture to disappear. MCPE-14523 Putting pressure plates/any carpet next to any side of the glass makes that side of the glass invisible. MCPE-14869 Graphics of the glass is gone while a block is placed beside. Redstone repeaters not working the way it should. MCPE-15931 Placing carpet/pressure plate near the glass makes it invisible. 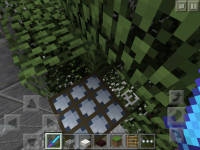 MCPE-16044 snow layer cause side of leaves missing texture. 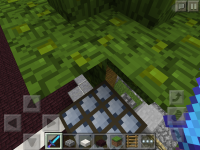 MCPE-16917 Cakes are making leaves and glass transparent.